What do we know about the impact of restorative justice programs in Canada? The beginning of the modern application of restorative justice in Canada is typically given as 1974 when the Mennonite Central Committee of Kitchener-Waterloo introduced victim-offender mediation in the early stages of court processing. A major impetus for the advancement of restorative justice came from the Parliamentary Standing Committee on Justice and Solicitor General in 1988 in the report titled Taking Responsibility. One of the report's recommendations was that the government support the expansion and evaluation of victim-offender reconciliation programs at all stages of the criminal justice process. In the 1990s we have witnessed a significant increase in interest and activity in the field of restorative justice, including efforts to assess the impact of restorative approaches. The published restorative justice research literature was surveyed as part of a broader review of directions and developments in restorative justice in Canada. There have been relatively few formal evaluations of restorative justice programmes in Canada. Evaluations of court-based victim-offender mediation programmes (VOMP) have found that: a) they dealt with relatively minor offences involving little or no injury and small material losses, and b) victims and offenders were very satisfied with both the process and outcomes of mediation. A preliminary evaluation of a VOMP with post-sentence cases of serious crime found: a) there was strong support for the program among victims, offenders and criminal justice practitioners, and b) that the principal motivations for victims' participation were to know why the offence took place and to communicate to the offender the impact that the crime had on them. A Community Justice Forum (CJF) is a restorative justice approach that brings together the victim, offender and community members in a face-to-face meeting to discuss the harm done by the offender and what steps can be taken to repair the harm. An initial evaluation of CJFs facilitated by the Royal Canadian Mounted Police indicated high levels of satisfaction among victims, offenders and facilitators. Another restorative approach involves making restitution to victims. A study of offenders being released from prison to halfway houses in order to make restitution found generally positive attitudes among victims and the more that the offender repaid the victim the more likely he was to complete his halfway house placement. Restorative approaches have also been used in the context of alternatives to imprisonment. In one such program, victims provided input into community-based alternative sentence plans. The results of the evaluation showed that the offenders who participated in the program, which included treatment for the offenders as well as the restorative component, had a lower recidivism rate than matched groups of probationers and inmates. Restorative justice approaches may also have financial benefits. A cost-benefit study of a circle healing process founded on Aboriginal teachings and traditions and designed to address sexual abuse revealed not only significant improvements in the health and wellness that community members attributed to the circle process and lower offender recidivism rates but also significant savings relative to processing through the mainstream system. Finally, survey studies and general reviews of the evaluation literature have shown favourable attitudes towards restorative justice, small reductions in recidivism, a positive effect on victim satisfaction and an increased likelihood of completing restitution agreements. The existing body of research suggests that restorative justice programs are yielding positive results and that this is a policy direction that should be pursued. More research is needed to measure the impacts and identify the effective components of the various restorative justice approaches in order to guide further policy development in this emerging field. Cormier, R.B. (2002). 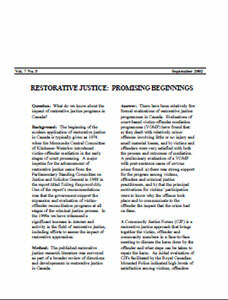 Restorative justice: Directions and principles – developments in Canada. (User Report 2002-02). Ottawa: Solicitor General.